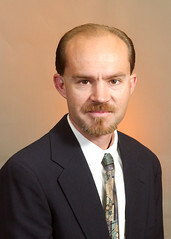 John Hasenbein graduated from Washington University with a BS (1991) in Systems Science and Mathematics and from the Georgia Institute of Technology with an MS (1995) and PhD (1998) in Operations Research. He worked, during a summer internship and later a funded research project, for Harris Semiconductor on developing detailed simulation models of semiconductor fabrication operations and testing dispatch and scheduling rules derived from multiclass queueing models. He received an International Research Fellowship from the NSF to do joint research with the Center for Mathematical Research (CIMAT) in Guanajuato, Mexico during the summer and fall of 1999. In June 2002, he received an NSF Career Award for a proposal entitled "Scheduling of Multiclass Queueing Networks via Fluid Models." He has taught classes in the areas of stochastic models, queueing theory, operations research modeling, and applied probability and statistics. His research interests lie primarily in the area of stochastic modeling, especially of complex manufacturing, computer, and telecommunication network systems. His more theoretical interests include stability of multiclass fluid and queueing models, diffusion approximations to queueing networks, and large deviations for regulated Brownian motion. His applied interests include development and testing of efficient dispatch, batching, and setup rules in semiconductor wafer fabrication, and analysis of systems with wait-dependent service times.